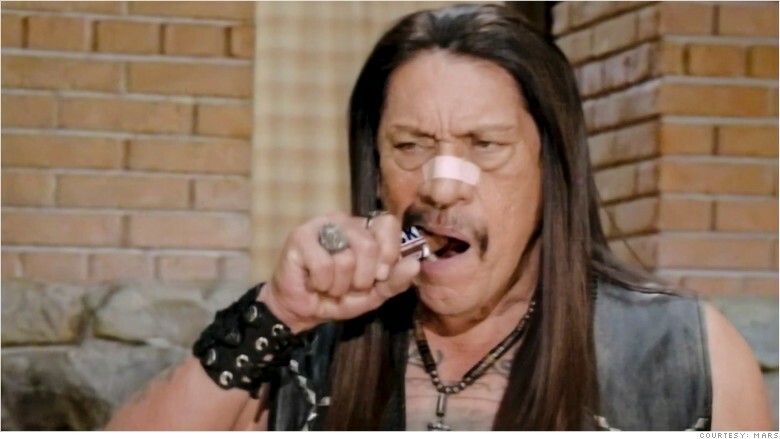 Super Bowl ads, like this Snickers spot starring Danny Trejo, used to cost a mere $4.5 million. But now they're a record-breaking $5 million for a 30-second spot. Deflategate hasn't let the air out of Super Bowl ad prices, which are at a new record. "Super Bowl advertising is already proving to be more lucrative than ever, with 30-second spots selling for $5 million dollars," said Les Moonves CEO of CBS, during a earnings call Wednesday with investors. That's the price for Super Bowl 50, the golden anniversary of the biggest annual game in football, scheduled for Feb. 7, 2016, at Levi's Stadium in Santa Clara, Calif.
CBS (CBS) is broadcasting the game and, in an unprecedented move, will live stream ads in addition to airing them on TV. CBS is packaging the ads so the $5 million buys air time and live streaming. This easily beats the prior record of $4.5 million for a 30-second spot. That's how much NBC charged for ads during Super Bowl 49 earlier this year. That was $500,000 more than the year before. Moonves said that thanks to the Super Bowl ratings, he's already comfortable saying that "CBS will win the 2015-16 season."